We are sad to report that yet another wonderful greyhound has succumbed to osteo. We got the word from Holly and Mike Miller that their beloved Benny was lost to bone cancer that involved his leg. The cancer was pervasive and painful; they decided to let Benny go since it had progressed to restricting his life. This was a hard decision to make, but they made it in Benny’s best interest. Holly and Mike and their children adopted Benny in early 2008. They are a young family with young children and they had no fenced in yard. What would normally have been an adoption application that would have been turned down, Holly and Mike seemed to be very responsible and they convinced us that they would take good care of any greyhound they adopted. They not only took wonderful care of Benny, but they serve as the example of why we still process adoption applications on a case by case basis. Benny would have missed a wonderful home and we would have missed knowing such great people had we not given them a chance. Benny was loved dearly by his family. 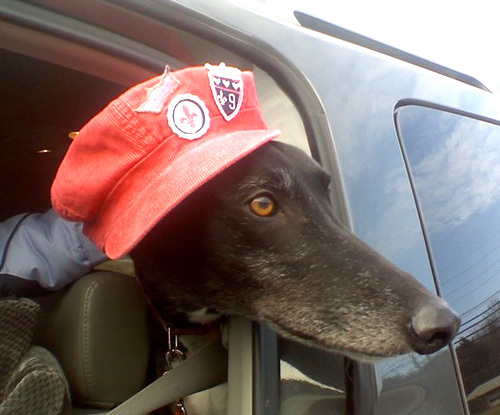 He was a very laid back and easy going greyhound that loved the attention and he got along famously with the children. He had a wonderful home, although it was not for as long as we all would have liked. We thank Holly and Mike for their love and devotion to a very special hound. Although Benny will be greatly missed by many, we are grateful that he had a chance to be so happy.